I bet you thought I was going to talk about movies all week. I guess I tricked you, didn’t I? I’ve been trying to make some more wholesome dinners. It’s easy to eat pasta or rice and broccoli every night when you’re busy, and as much as I love both of those, variety is good too. I picked out some easy recipes this weekend and with the help of our slow cooker have made them in no time after work. 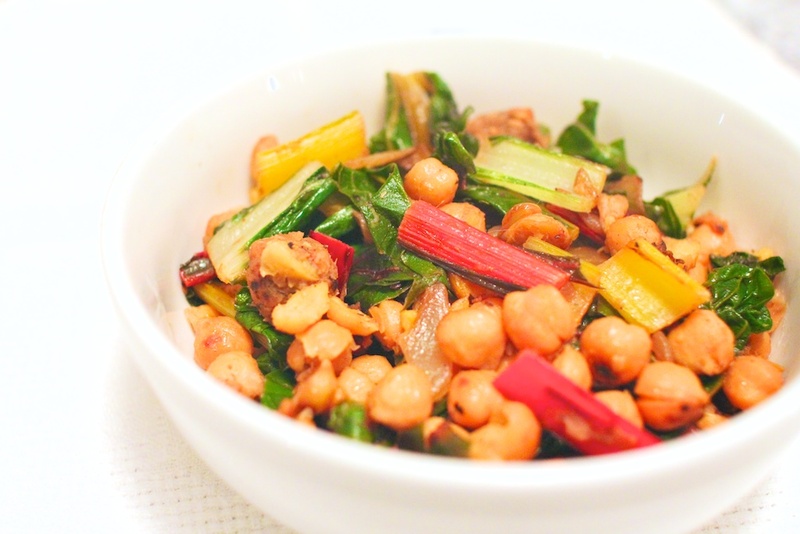 The first experiment was lemony pan-fried chickpeas with rainbow chard. This lovely dish came together in about 20 minutes and was shockingly flavorful especially for how simple it was. I added in some seasoned jackfruit that I had cooked up over the weekend just to make it a little more substantial and used rainbow chard for a little bit of color. The whole thing was very satisfying and I loved the varied texture of chard, chickpeas and jackfruit together. It was a nice reminder that meals can be simple and still be special. 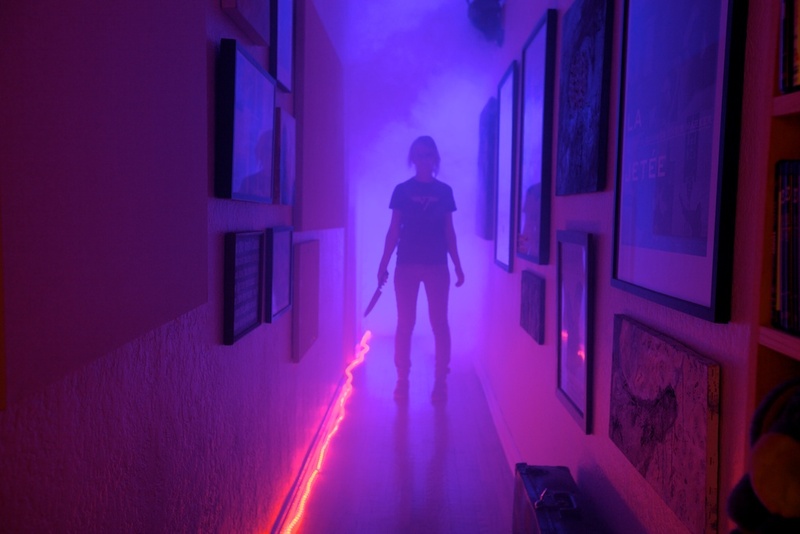 This weekend we had our 4th Annual Halloween Horror Movie Marathon. 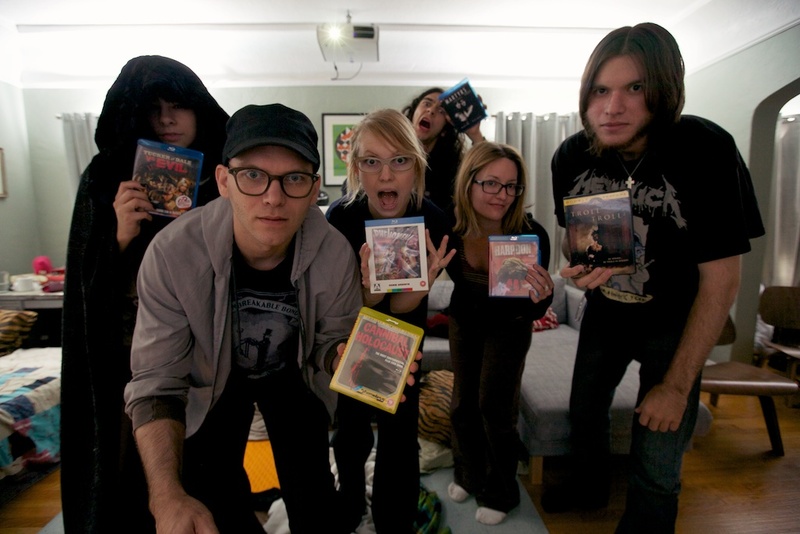 When it started out a few years ago, it was just a sleepover where we’d watch scary movies, but has since turned into something much crazier, as we watch horror movies for over 24 hours straight. Watching horror movies for so long with so little sleep definitely does some strange things to your mind and it starts to feel like you’re living in a horror movie yourself. So here’s a glimpse into what it’s like… Get ready for a lot of photos. 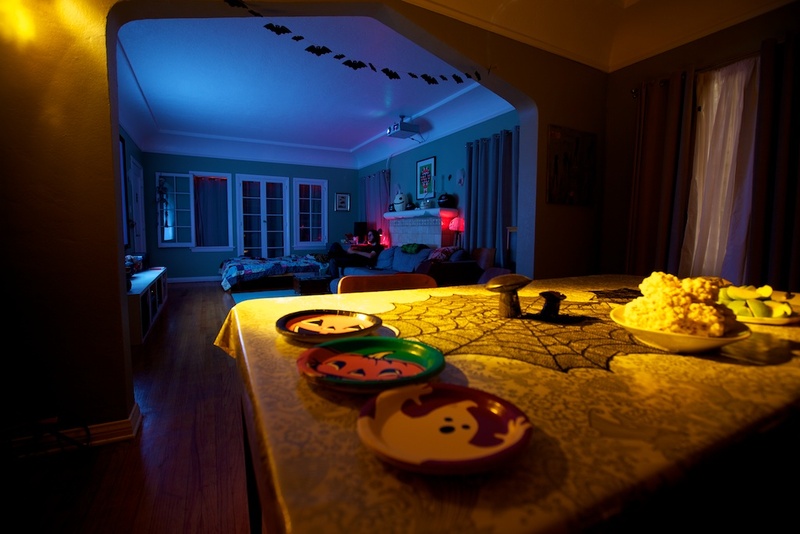 To set the stage, we turn our living room into a screening room, blacking out all the windows and adding some creepy mood lighting. We even brought our spare bed out to add some comfy viewing spots. 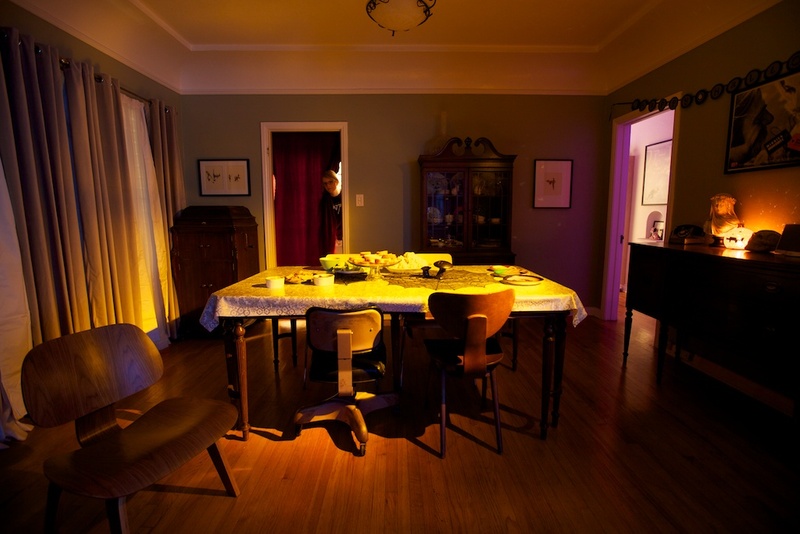 We continued the creepy lighting throughout the apartment. Here are the beginnings of our snack table. Snacks are vital for getting though the night. We hung a velvet curtain to keep the light from our kitchen down since there isn’t a door. Dining room chairs were moved to the living room for extra seating. We had about 15 people throughout the night, although only a handful made it till morning. 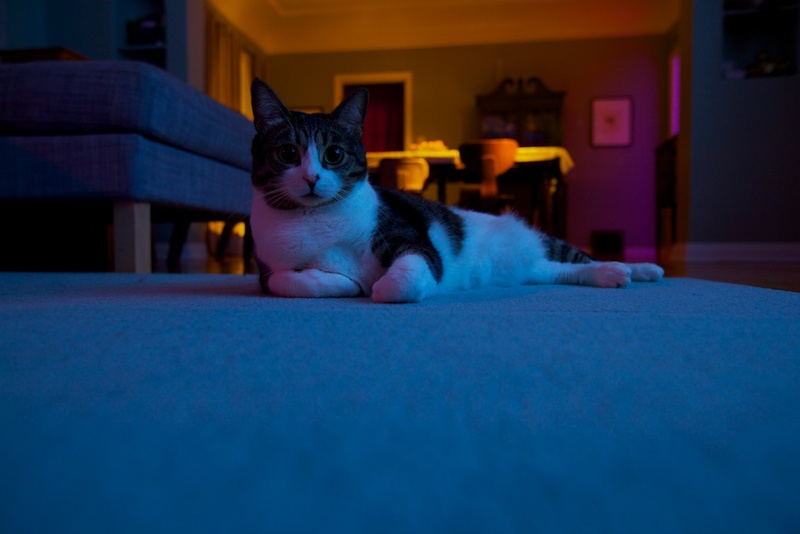 Initially Meeme was excited about the party, hanging out on our new carpet. She and Mochi got scared though and spent the rest of the evening watching movies in their own room. They particularly liked Beetlejuice. 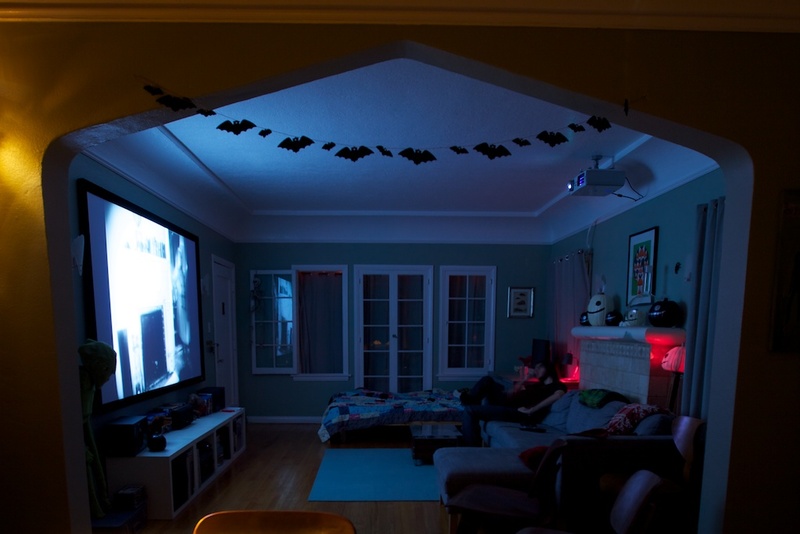 We made our bedroom into a second screening room for our friends who don’t like scary movies as much as we do. Everyone toughed it out though and the cats had the room to themselves. 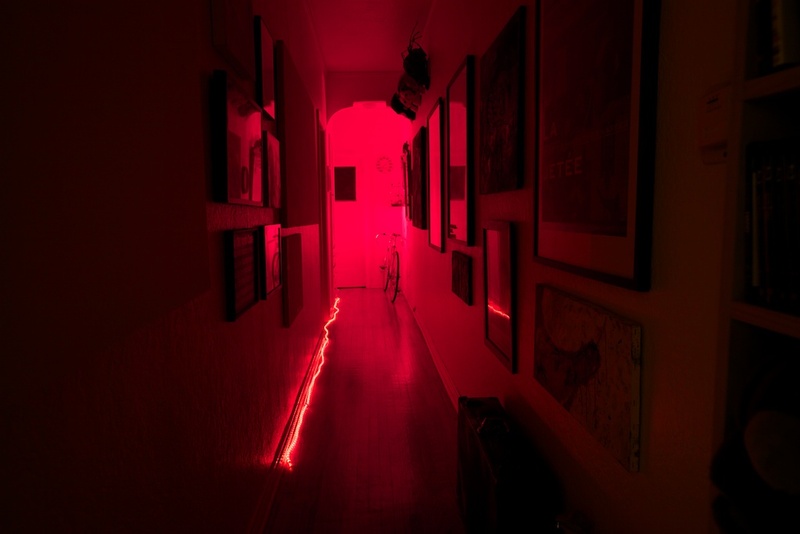 This hallway is definitely horror movie material. So we’ve set the stage, shall we get to some of the treats? I had to make sugar cookies as it has become a yearly tradition. 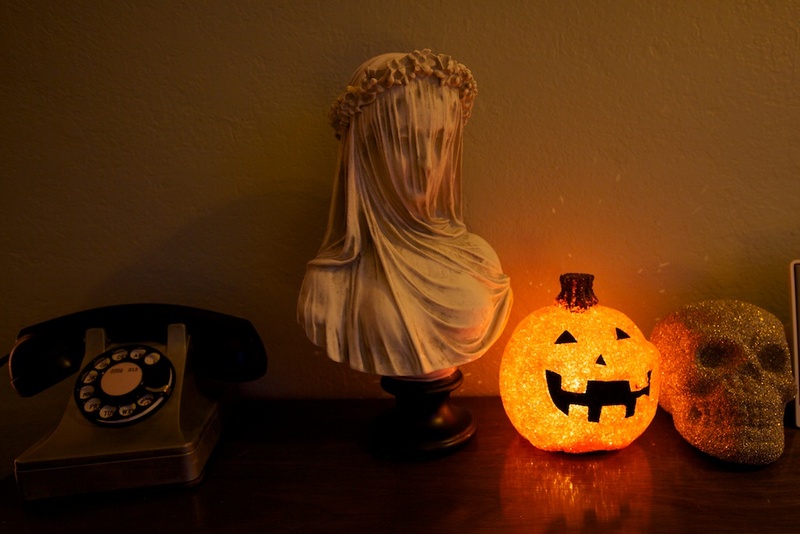 This year I opted for pumpkins to go a long with my pumpkin theme. Shawn requested that we make some healthy things instead of all sugary treats and we came up with some scary looking drinks. 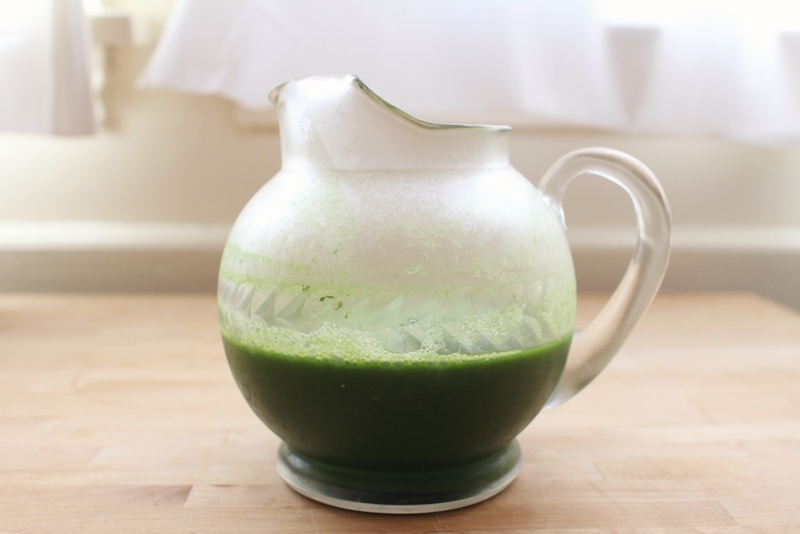 While kale, celery and ginger juice, might be fairly common, it still has the look of a strange brew. Or how about some blood? 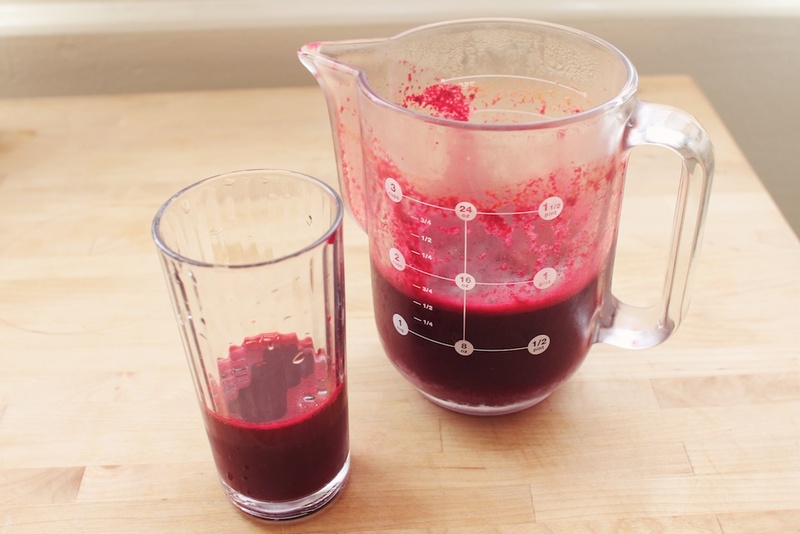 I mean, carrot beet juice. 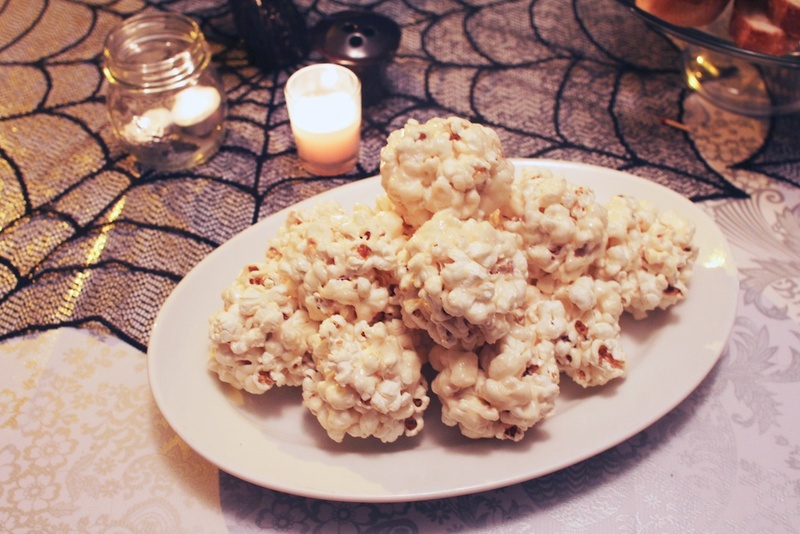 There were popcorn balls made with Dandies. 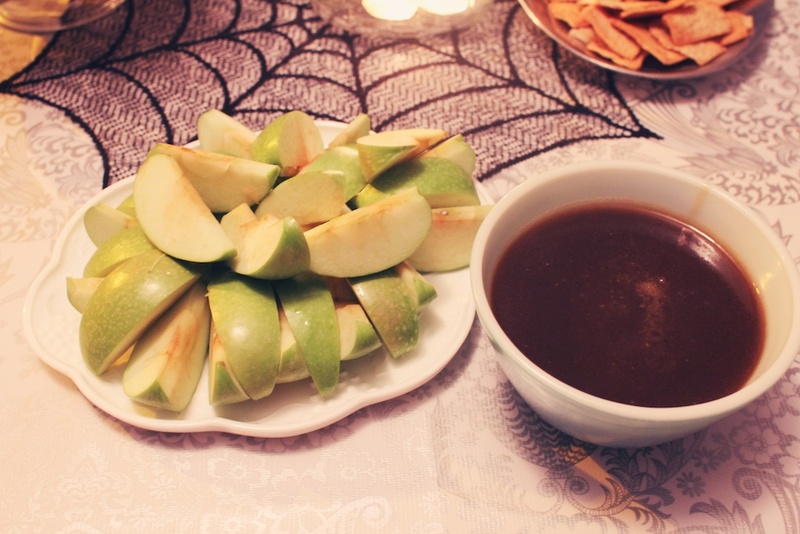 Apples with caramel sauce for dipping. 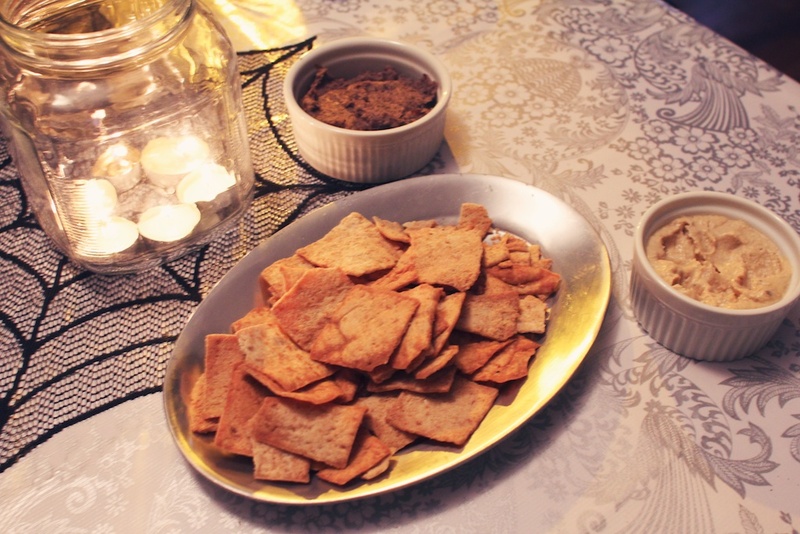 There were pita chips with black bean dip and hummus as well as crostinis with spinach dip. 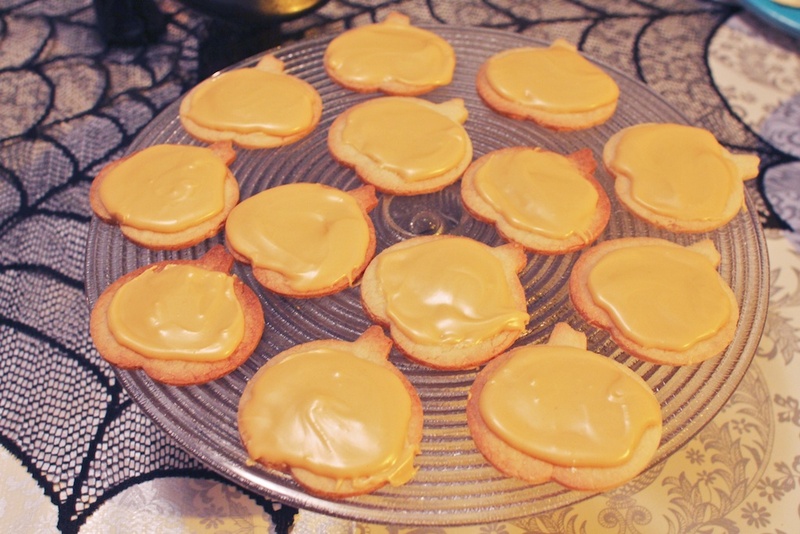 I ran out of time before guests started arriving and hastily frosted the pumpkin cookies. Not too cute but still deliciously sweet. As a later night snack, I made some quesadillas jack-o-lanterns. 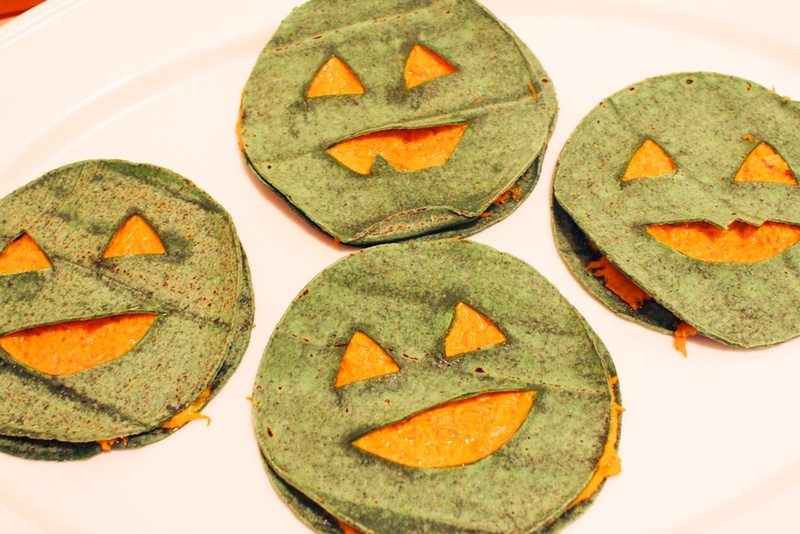 I found some green cactus tortillas and knew they would be perfect for a Halloween. During the night we also made tons of tofurky dogs with lots of toppings, pizzas and even coffee cake. Oh and lots of coffee. Lots and lots of coffee. 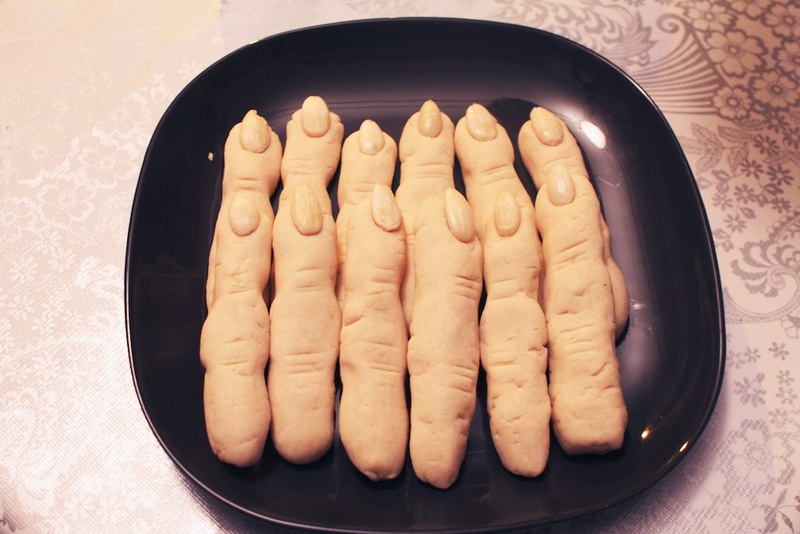 Kim stopped by and brought these amazing lady fingers. How creepy? Like I said, we watch straight through the night and well into Sunday. This is the remaining 6 of us some time on Sunday afternoon. Jenny L., Shawn, Me, James, Jennifer Y. and Kyle. Without a doubt this has been the best year yet, so much fun! Already I can’t wait till next year. 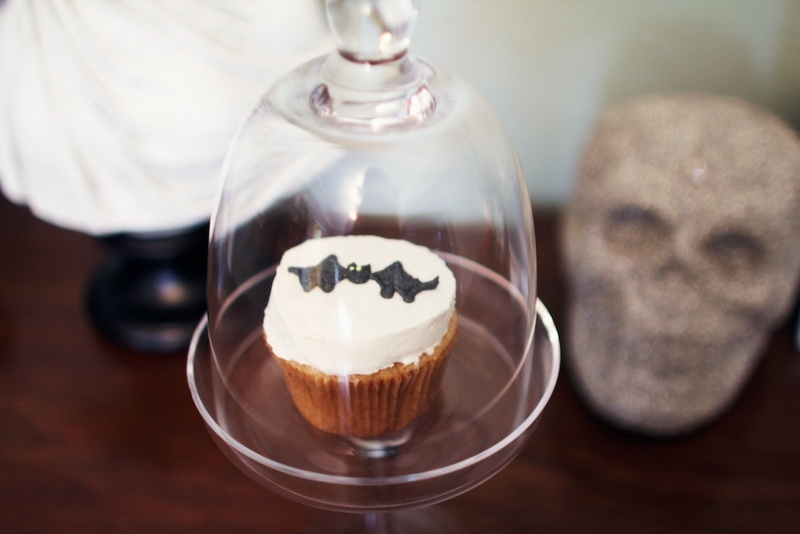 While technically speaking I’m no longer in the cupcake business, I had a special request for some bat cupcakes and I just could not turn it down. Especially with Halloween coming up, I couldn’t miss an opportunity to try out some bat decorations. 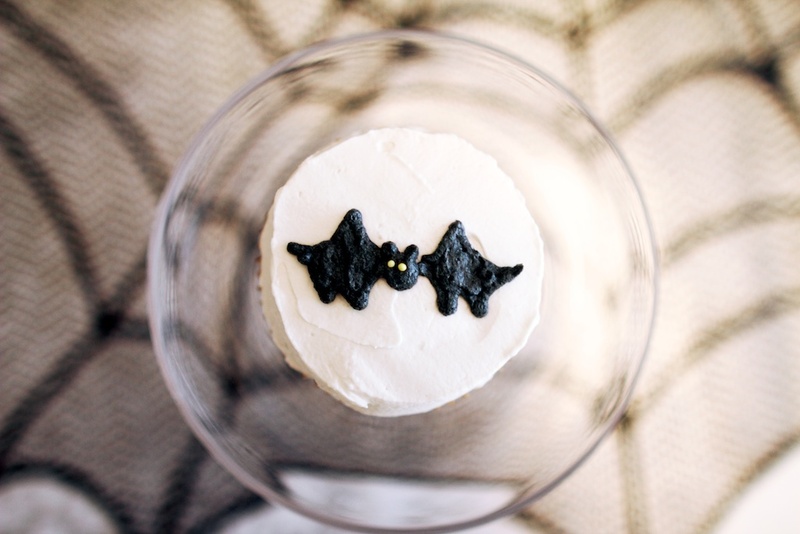 I spent a long time practicing drawing bats in frosting and but every one felt like something was missing. I was about to give up and go another route when I realized what it was. Eyes! They needed eyes. I grabbed some sprinkles and very carefully placed two tiny beady eyes on each bat. They manage to still be a little cute without being cartoonish. These would be perfect for a Halloween party or just for some who liked bats. Just imagine a dozen of these little guys at a party. I’m debating making cupcakes for our Halloween gathering this weekend, as I make cupcakes every year. 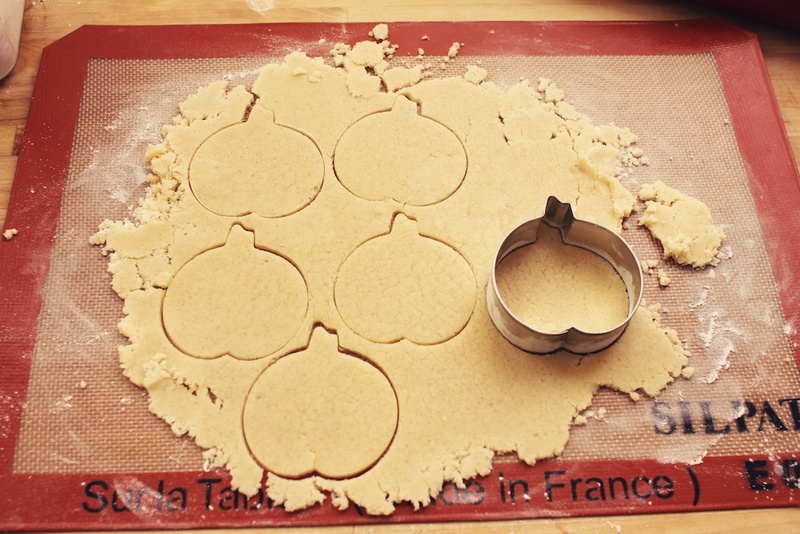 Maybe I’ll make ones with pumpkins on top. What’s your favorite way to decorate cupcakes? Hello! I’m back with more lentil loaf. 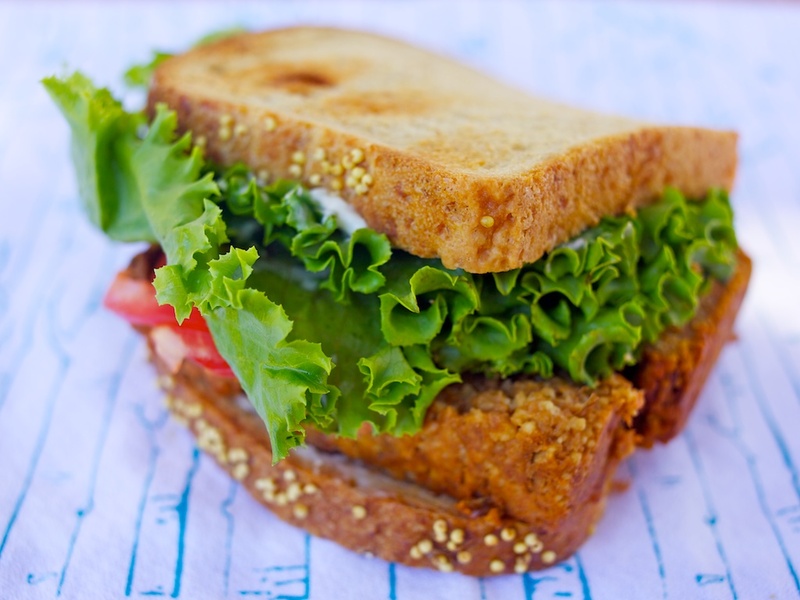 This second recipe is even more flavorful than the last lentil loaf recipe. It doesn’t have the chewiness, but instead has a grainier texture. We ate this loaf in sandwiches, which worked out great as they were tasty and filling; perfect for a picnic lunch. Mix all ingredients together in a bowl mashing the lentils as you go. Make sure you mix everything really well. Put into a lightly oiled loaf pan and brush the top with ketchup. Cook for 45 minutes. Remove from oven and let cool for 10-15 minutes before serving. As soon as the weather cools I find myself drawn to the kitchen to make wholesome foods. With all the wonderful fall flavors to experiment with, I generally find myself making sweet desserts: pumpkin loaves and apple pies. This year though, I’ve been fantasizing about savory fare like potato topped, vegetable pies and seitan with gravy. This weekend was full of projects and hard work which left little time for fun in the kitchen, let alone trips to the grocery store. Instead I cooked up 2 lentil loaves using the dregs of our pantry and leftovers in the fridge. While that might sound unappetizing, that is the simple beauty of a lentil loaf. You can throw nearly anything in there and it can still turn out delicious. 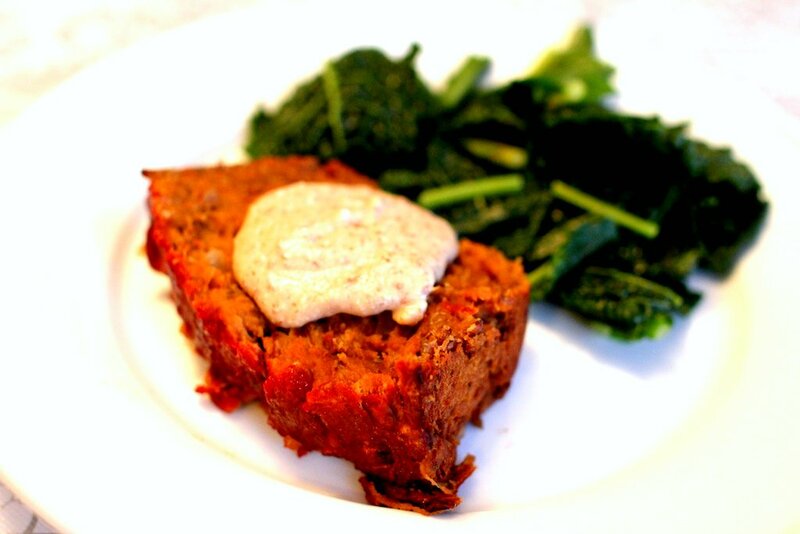 While I often include some veggies in our lentil loaves, this one is pure faux-meaty goodness. 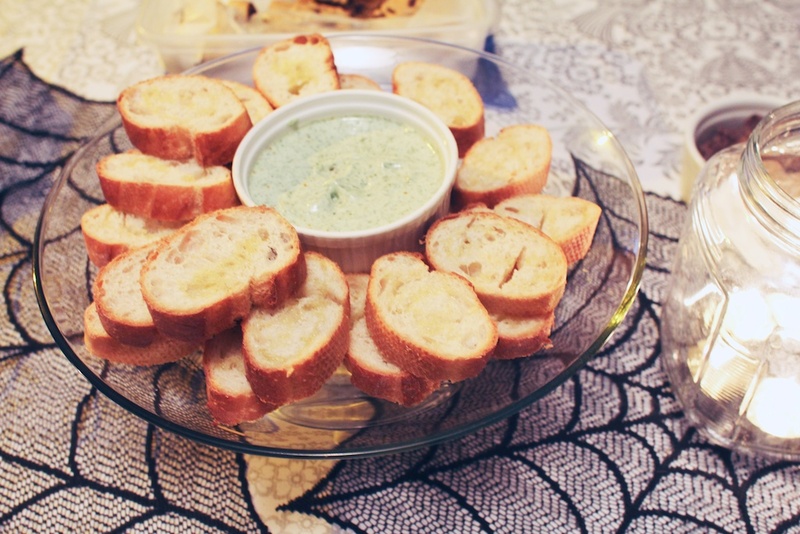 It’s moist and a little bit chewy, with a tiny bit of spicy here and there. We had it with some almond gravy, but it would be wonderful with some simple brown gravy as well (in fact, it doesn’t even need the gravy, but I like gravy and will eat it at any opportunity I get). I made two completely different recipes, so today I’ll share the the first and once we try the second I’ll post it as well. Heat a bit of oil in a small pan and saute the onions and garlic until soft and fragrant. Mix all ingredients, minus the wheat gluten and veggie broth in a bowl. I like to use potato masher to smoosh (yes, that’s a technical term) some of the lentils. Mix together until you have a consistent mush. Add in the vital wheat gluten and vegetable broth and knead together until it becomes slightly elastic. Press the dough into a greased loaf pan. Brush the top with ketchup to cover it. Bake for 45 minutes. Let cool for 10-15 minutes before serving.